Russia has started construction on an advanced early missile warning radar in its Orenburg region to strengthen the country’s missile defences. The new Voronezh-class radar will be part of the high-tech early warning network the country hopes to build by 2020. The radar will used in addition to the existing four Voronezh-class radars in Russia and a further two are set be constructed. “In addition to the Orenburg radar, the preparations for construction of new-generation radars are underway in the Krasnoyarsk and the Altai territories,” Colonel Alexei Zolotukhin was quoted by RIA Novosti as saying. Voronezh radars provide long distance monitoring of airspace against ballistic missile attacks. The first radar was built in Lekhtusi near Saint Petersburg and started operations in 2009. The Voronezh-DM new generation radar system successfully passed state tests in April and May. 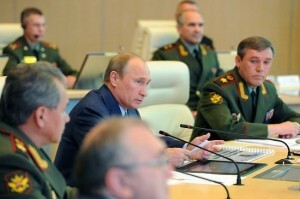 During a Visit to the Armed Forces Central Command Centre in June, Russian President Vladimir Putin highlighted the importance of the new radar network. “Modern radars must be an important link in the missile warning system, seriously enhancing the combat potential of Russia’s aerospace defence on the southern and south-western strategic directions. “Suffice it to say that the Voronezh-DM radar station will completely take over the functions previously performed by the Dnepr and Daryal systems, which are located in the Ukraine and in Azerbaijan, respectively; in Mukachevo and Sevastopol, Ukraine, and Gabala in Azerbaijan,” President Putin said. The modern radar system is set to strengthen Russia’s security guarantees, added Putin. “Radar station allows us to literally look over the horizon, to detect even the most inconspicuous object and to detect in a fraction of a second various types of missile launches hundreds and even thousands of kilometres away from our borders,” said the president. Voronezh-class radars have an operational range of 6,000 km and can be quickly redeployed with little expenses. The Stockholm International Peace Research Institute (SIPRI) said last year that Russia has entered the top three list of countries who have increased military spending. According to data made public by the US Congress, the US has approved defence spending of $550 billion for 2013.